Purchasing a home is a dream for pretty much everyone. But, taking on that massive debt can prevent you from retiring earlier, sending the kids to college, or taking that dream vacation. Like any other debt, if you’re able to get rid of your mortgage as soon as possible, the better off you’ll be down road. This may sound like an uphill battle that you can’t win, but if you follow these 12 expert tips, you may be able to actually pay your mortgage off within a decade. Discount: prepaid interest on the mortgage; the more you pay, the lower the interest rate. If you plan on staying in your home for the foreseeable future, it may be worth paying for these points since you’ll end-up saving money on the interest rate of your mortgage. 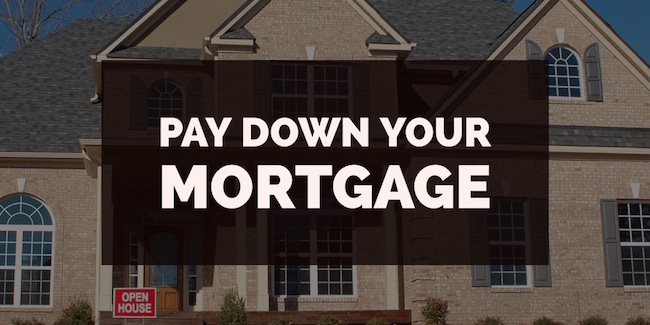 You could save that extra cash each month and put it towards your overall mortgage payment. “Call your mortgage holder or look at the latest statement. You’ll need the current outstanding balance. Once you have that number, you’ll need to calculate what the payments will be to pay off the mortgage in five years,” says Neal Frankle on the Wealth Pilgrim. “Each time you pay extra on your mortgage, more of each payment after that is applied to your principal balance,” says best-selling author and radio host Dave Ramsey. Make an extra house payment each quarter, and you’ll save $65,000 in interest and pay off your loan 11 years early. Divide your payment by 12 and add that amount to each monthly payment or pay half of your payment every two weeks, also known as bi-weekly payments. You’ll make one extra payment each year, saving you $24,000 and shaving four years off your mortgage. Round up your payments so you’re paying at least a few extra dollars a month. Andrea Stewart and Honer were able to pay off their mortgage in just 7 years. They began by planting a garden in their backyard. “It’s actually easier to go into your backyard and pick things than go to the grocery store,” Honer said. “We like the organic element as well as it’s a huge bill cut.” This not only saved on their grocery bills, but also on their gas since they didn’t have to drive the store as much. Dedicate every windfall — a bonus, raise, or holiday or graduation gift — you receive toward paying down debt,” recommends Marilyn Lewis in Money Talks News. You can shorten the loan and brave through higher payments until it’s paid off. You can get a lower interest rate. You must be up to date on your mortgage. Your loan must be owned by Freddie Mac of Fannie Mae. With the sharing economy in full-swing, it’s easier than ever to rent out an extra bedroom, garage, or parking space. If you go on vacation for two weeks, consider listing your home on Airbnb so that you can make a little extra money while you’re away. That extra money could all be added to your mortgage payment. You could also go all-out and rent your entire room, like personal finance writer Sean Cooper. Cooper was also frugal and had a second job on the weekends, but he was able to knock-off $100,000 on his mortgage in just two years by renting out his home. Hi, I'm Albert. I'm a content ninja. When I'm not writing and brainstorming content ideas, this New Jersey native spends his time traveling, blasting music, and keeping his chocolate lab at bay.